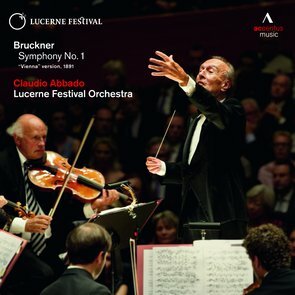 Claudio Abbado's account of Anton Bruckner's First Symphony, which the composer once nicknamed his "cheeky maid," is now available for the first time in the late Vienna version of 1890/91. In the summer of 2012, together with the hand-picked musicians of the LUCERNE FESTIVAL ORCHESTRA, he continued his memorable cycle of Bruckner performances with an interpretation that the critic Peter Hagmann described as "plainly and simply, a sensation" in the Neue Zürcher Zeitung: "It was captivating how Abbado managed to elicit the Janus-faced character of the symphony: on the one hand, the sense of a breakthrough that inheres in this music, making the outburst of Bruckner's expressive intent and edgy nonconformity tangible, yet on the other hand allowing us to hear the great symphonic blueprint that the First truly is." And the Frankfurter Allgemeine Zeitung also wrote of an interpretation that was "distant from all formality," venturing "a glance into the dramatic abyss." The live concert recording is now available on CD.